I love and need to live by the sea, or ocean. Even after all the grief and disaster hurricane “Sandy” brought to my household and my own health as the aftermath, I can’t think about moving inland – think that the salt water and the scent of seaweed are part of my DNA. This weekend my family and I went biking in a neighboring park and nature reserve, the park is located on the shore of a bay and adhering salt water marsh. Beautiful weather, majestic cranes, laughter and good times. I felt absolutely happy riding on the bumpy grassy trails, descending to the sandy little beach , feeling the wind in my hair, breathing in crisp fall air scented with fallen leaves and the ocean. I was there with my husband and kids one minute, and then I was back in my childhood, thousands of miles and twenty five years away. Back to the fall of 1988, when it was still warm, and my friends and I would ride our bikes to a little park that sat just above the beach. The trees would change color from green to all shades of yellow and gold. The ground was covered in a thick carpet of fallen leaves , and the girls would gather big bouquets of golden maple and chestnut leaves, while the boys carried the bikes down the cliff all the way to the pebbled beach. We followed the boys once all our bikes were down by the water, and just hung out, just talking, competing throwing pebbles into the sea , wreathing the gathered leaves, singing to the accompaniment of guitar, and watching the fishermen. Good times back then, and great time this weekend, filled with new memories. The flashbacks and sea breeze, left me craving fish. On the way home we stopped at the docks, and got beautiful striped bass from the fish monger. 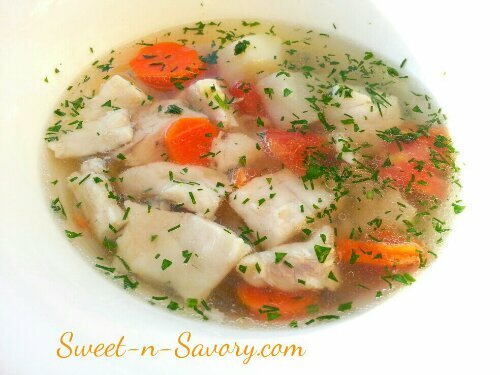 I got a little overexcited with all the fresh fish, and got more than I needed for dinner, therefore it was destined for the extra fish to become a flavorful soup. After all it’s only natural for a girl from Odessa to make an Uha ( [ooha], fish soup) with a side of salamour(A spicy condiment that’s served with uha to be added to the soup or to the poached fish). 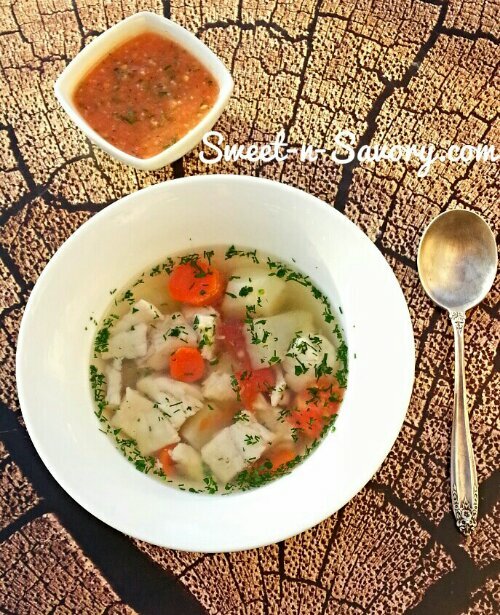 *The Uha I made is very basic and easy to make, although it takes a little time for the broth – be patient a good broth will yield the most flavorful soup. The proportions are approximate. You will need to fillet your fish, and reserve the head, skin and bones for the fish broth; the fish monger can fillet the fish for you. In my family, my Dad and Grandfather made the Uha, and they poached large fish steaks in the broth to be eaten separately topped with salamour, personally I didn’t like that and decided to fillet the fish instead to avoid the bones. I also prefer to add the salamour directly into the soup for a little spice, my kids love dipping bread into it, and leave the soup as is. 1. 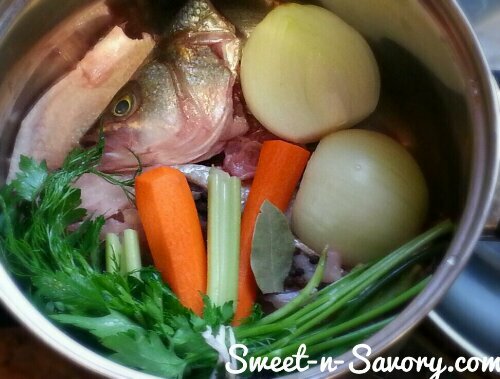 Add all the ingredients for the broth into a 5 quart soup pot. Fill the pot with water and let the broth simmer on the cooktop on low-medium heat for about an 1 ½ – 2 hours skimming the foam off the top. Do not let the broth come to a rolling boil, the broth will become murky. And we all know about fish in murky waters. 2. After the broth has cooked, discard the vegetables, the skin and bones of the fish leaving only the broth, or alternatively you can strain the broth into a different pot. 3. Add Potatoes, Carrots and your grains of choice to the pot and cook until the vegetables are tender. 4. Add the tomatoes and the cubed fish, cook for another 15 minutes. Adjust the seasonings. 5. Turn the heat off and add chopped herbs and lemon juice. 6. Serve with Salamour on the side and a nice crusty bread. Add all the ingredients in the blender and mix. I used an immersion blender. Adjust the seasonings and heat to your taste.